Visitors and local alike will delight in the acre-sized, magical ice castle that has been brought back to the state of New Hampshire. The new location of Ice Castle in Lincoln has quickly become a popular attraction in the area. Ice Castles is an organization that builds their popular ice castle attractions at several different locations throughout the United States, as well as Canada. Tickets to the Ice Castle can be bought at the Ice Castles website. These ice castles are constructed by hand, utilizing icicle that have been harvested by the Ice Castles company. The ice castle varies each year, often featuring numerous turrets, tunnels, archways, and a tandem ice slide. There are also waterfalls incorporated into the ice castle, lit up by many colored lights. The stunning work of art made of ice has become a popular winter attraction in Lincoln, and must-see for anyone in the area while it is open. The Ice Castles have become a major sensation on social media, and have drown over one million visitors over the past several years to the five locations the Ice Castles company has throughout North America. A spectacular and amazing sight at the Ice Castle awaits locals and visitors alike at the Hobo Railroad, located in Lincoln. The Ice Castles company based in Utah has brought their fantastic ice castles to the state of New Hampshire, and the crew keeps creating amazing ice castles year after year. The Ice Castle of Lincoln, New Hampshire is approximately the size of an acre. 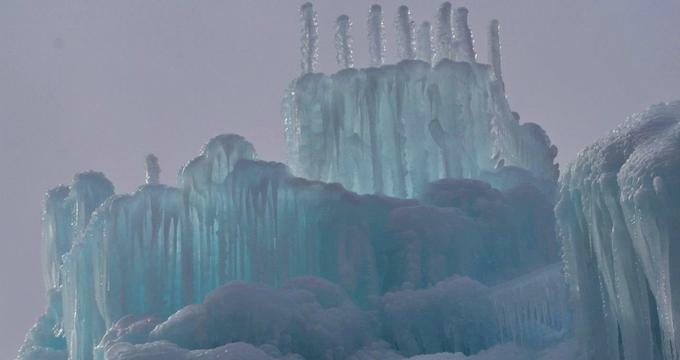 At its tallest points, the ice castle reaches around twenty-five feet in height. It takes the artisans responsible for building these elaborate ice castles around four thousand hours combined to drip, grow, and shape the numerous icicles in order to create such as fairytale, life-sized playground. Since the year 2011, visitors from across the entire world have come to the various locations of Ice Castles to explore the impressive interactive castles made out of ice. The ice castles contain a number of different features designed to create a fairytale castle for all to enjoy. Such features include tunnels carved out from the ice, frozen thrones, slides, and fountains. These castles also feature towers reaching amazing heights. Numerous colorful LED lights are frozen within the ice castle’s twenty-five million pounds of stunning ice. These lights twinkle along to music, providing a kind ambiance of magic to the already astonishing ice structure. Visitors can explore the awe-inspiring Ice Castle during the daytime, and still find it to be an amazing winter attraction. At night, however, this spectacular structure made entirely of ice comes to life with the help of the colorful LED lights that glow within the ice and give the castle an even more magical appearance. Each year brings an even more amazing and fun icy experience in the form of caves, waterfalls, thrones, slide and more at Ice Castles. For all of the kids, and even Disney-loving adults, who love the movie Frozen, this real life castle made of ice is sure to be impressive.